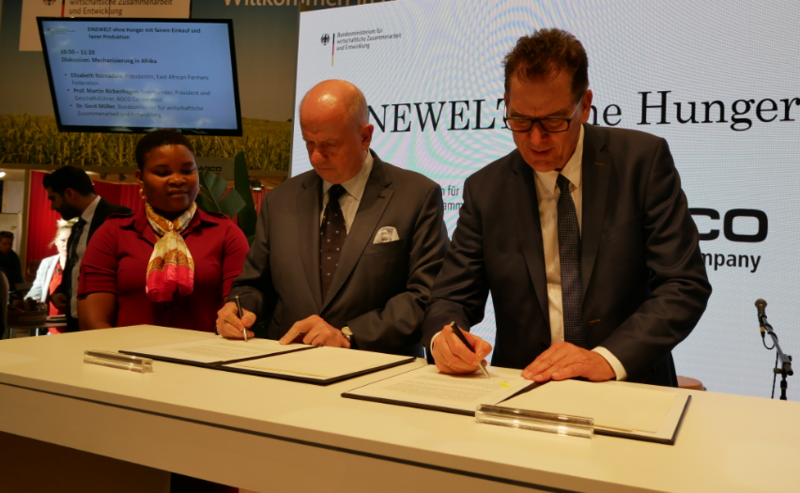 BERLIN, Germany – AGCO, Agriculture Company, a worldwide manufacturer and distributor of agricultural equipment and solutions, has signed a Letter of Intent (LOI) with the German Federal Ministry of Economic Cooperation and Development (BMZ) to implement a joint agricultural project in Africa. The mechanization activities of both the BMZ and AGCO are designed to contribute to the United Nations’ 2030 Agenda and Sustainable Development Goals (SDG) to eradicate extreme poverty and end hunger by 2030. The Goals also aim to double the agricultural productivity of small-scale food producers, ensure sustainable food production systems and implement resilient agricultural practices. The BMZ provides companies with financial and technical support for joint projects. The partnership enables companies to make effective and efficient contribution to the implementation of development objectives within the framework of their business activities. With its special initiative ‘One World – No Hunger’, the BMZ is a strong supporter of agriculture and rural development through its Green Innovation Centers in African and Asian countries. AGCO is one of global leaders in the design, manufacture and distribution of agriculture equipment and solutions and supports more productive farming through its full line of equipment and related services.